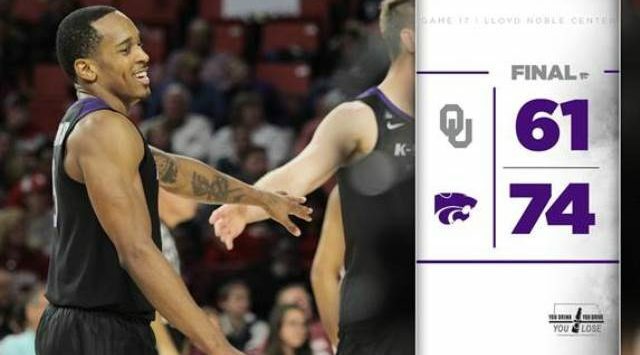 NORMAN, Okla. – Senior Barry Brown, Jr., and Dean Wade combined for 45 points, as Kansas State led wire-to-wire in knocking off its second consecutive Top 25 opponent on the road with a 74-61 win over No. 20/19 Oklahoma in front of 7,597 fans at the Lloyd Noble Center on Wednesday night. It marked the first time in nearly seven years that the Wildcats have defeated back-to-back Top 25 opponents on the road since wins at No. 9 Baylor (57-56) and No. 3 Missouri (78-68) on February 18 and 21, 2012. Brown posted his third consecutive 20-point contest – a career first — with a game-high 25 points on 11-of-19 field goals, including 3-of-4 from 3-point range, while Wade scored 20 points on 8-of-14 shooting in just his second game back from missing 6 games due to injury. K-State (13-4, 3-2) jumped out to an 8-0 lead en route to holding a double-digit lead for most of the game, as the Wildcat offense tallied their highest point total (74) in 11 games on the strength of 50 percent (29-of-58) shooting from the field, including 54.8 percent (17-of-31) in the second half. The team also got a strong performance from the 3-point line, collecting double-digit treys for the third time this season on 45.5 percent (10-of-22) shooting. The nation’s fifth-best scoring defense (59.4 ppg.) also flexed its muscle in a total team effort, holding the explosive Sooners (74.4 ppg.) to just 61 points on 46.8 percent (22-of-47) shooting, including 27.8 percent (5-of-18) from 3-point range. It was the second-fewest points scored by Oklahoma (13-4, 2-3 Big 12) this season and the fewest since Wisconsin held the Sooners to 58 points on November 22. The Wildcats forced the Sooners into 16 turnovers and held an 18-8 advantage in points off turnovers. The win snapped a 3-game losing streak to Oklahoma at the Lloyd Noble Center. It marked the first win in Norman since a 66-63 overtime win on January 10, 2015. Brown and Wade were the only two Wildcats in double figures, but several others enjoyed solid performances, including an 8-point, 7-rebound effort by junior Makol Mawien. Junior Xavier Sneed posted an all-around effort with 7 points, 7 rebounds, 2 assists and 2 steals in 36 minutes. Senior Christian James paced two Sooners in double figures with 20 points on just 5-of-12 field goals, while fellow senior Rashard Odomes added 17 points off the bench on 8-of-10 shooting. The Wildcats jumped out early, scoring the first 6 points, forcing Sooner head coach Lon Kruger to call his first timeout just two minutes and 30 seconds into the contest. Senior Dean Wade was aggressive early, scoring 6 of the team’s first 10 minutes before leaving at the 14:02 mark. A 3-pointer by senior Kamau Stokes gave K-State a 13-3 advantage a minute later before Oklahoma knocked down shots on its next two possessions to cut it to 13-7 at the second media timeout at the 11:47 mark. The two teams traded runs over the next few minutes, as the Wildcats pushed the lead out to 20-7 on the strength of a 7-0 run, which included a 3-pointer from sophomore Mike McGuirl, but the Sooners responded with a 6-0 spurt that closed the gap to 20-13 with 7:48 to play before halftime. K-State again had the lead in double figures before a 5-0 run by Oklahoma cut the lead to 24-18 and forced head coach Bruce Weber to call his first timeout with 4:09 remaining. A jumper by senior Barry Brown, Jr., and a pair of free throws by junior Xavier Sneed gave the Wildcats a 28-18 lead at the 1:49 mark before the Sooners ended the half with a pair of 3-pointers to close it to 30-24 at the break. K-State connected on 44.4 percent (12-of-27) of its field goals in the first half, while scoring 11 of 30 points off 11 Sooner turnovers. Oklahoma was held to a first-half low of 24 points on 43.5 percent (10-of-23) shooting. Wade led all scorers with 10 points in the first half, while Brown added 8. The teams traded baskets in the early part of the second half before 3-pointers from Brown, Wade and senior Kamau Stokes on three consecutive possessions pushed the Wildcats to a 45-33 advantage at the 14:44 mark. After Oklahoma closed to within 45-38 with back-to-back baskets, Brown connected on consecutive jumpers to go with a jumper from junior Makol Mawien to again push the lead back into double digits at 51-38 with 11:57 remaining. The Sooners again cut the deficit to single digits with under 11 minutes to play before a Brown 3-pointer started a 10-2 run that put the Wildcats up 61-45 and forced Kruger to call a timeout with 6:26 remaining. The K-State lead stayed in double figures the rest of the way, including a game-high 19 after Wade’s second 3-pointer of the half extended the advantage to 69-50 with 4:42 to play. The Wildcats scored 44 points in the second half on 54.8 percent (17-of-31) shooting, including 57.1 percent (8-of-14) from 3-point range, while the Sooners scored 37 points on 50 percent (12-of-24) shooting. Brown scored 17 of his game-high 25 points after halftime, while Wade added 10. Barry Brown, Jr. – Senior Barry Brown, Jr., recorded his third consecutive 20-point game with a game-high 25 points on 11-of-19 shooting, including 3-of-4 from 3-point range, to go with a game-high 5 assists in 37 minutes. He has now scored 20 or more points in 20 career games, including on 5 occasions this season. 50.0 – K-State connected on 50 percent (29-of-58) of its field goals, including 54.8 percent (17-of-31) in the second half, as the Wildcats posted their highest point total (74) in 11 games, including the highest in Big 12 play.